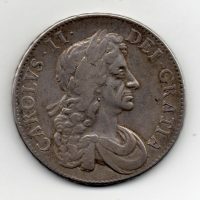 1673 over 2 Crown, Charles II third draped bust, reverse, Crowned cruciform shields, good very fine-nearly, attractive toning, rare. 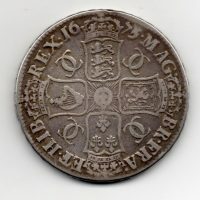 1673 Crown, Charles II third draped bust, reverse, Crowned cruciform shields, B over R in BR, ESC 47a: rare, good fine+. 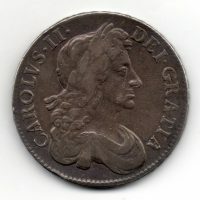 1680 Crown, Charles II third draped bust, reverse, Crowned cruciform shields, ESC 58: R2, nearly very fine, very rare. 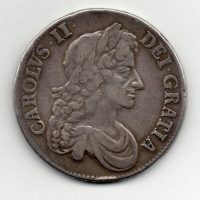 1680 Crown, Charles II fourth draped bust, reverse, Crowned cruciform shields, very fine, scarce year. 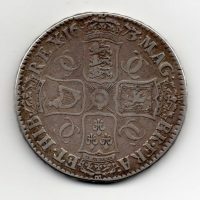 1675 over 3 Crown, Charles II third draped bust, reverse, Crowned cruciform shields, ESC 50a: R5 (5-10 known examples), good fine-nearly very fine, excessively rare. 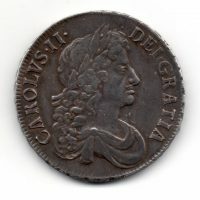 1684 Crown, Charles II fourth draped bust, reverse, Crowned cruciform shields, ESC 67: R (Rare), good fine-nearly very fine, coin comes with ticket, Ex Roderick Richardson (ticket price states £1,450). 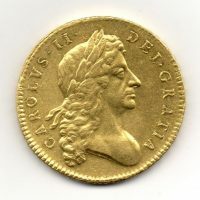 1682 Five Guinea, Charles II second laureate bust, reverse, crowned cruciform shields, T. QVARTO on edge, extremely fine +, lustrous, usual weak strike otherwise a lovely example. 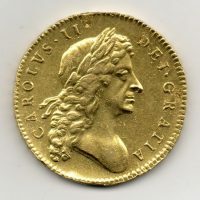 1683 Five Guinea, Charles II second laureate bust, reverse, crowned cruciform shields, sceptres in angles, QVINTO on edge, S.3331, good extremely fine-virtually uncirculated, very rare in this grade.